SPCookieQueen: Why does grandpa have an old lady on his arm? Why does grandpa have an old lady on his arm? I find going to the gym not only provides my body with the exercise it needs but my mind the fodder it needs on occasion. I was standing around with a few ladies waiting for our class instructor to arrive when two of them struck up the conversation of "jonesing" (their words, so not mine) for new ink. Then they proceeded to lift up articles of clothing to exhibit their hidden treasures and compare notes; which area was the most painful, which empty spots they had future plans for. I felt slightly (actually make that extremely) uncomfortable at the moment. How does one bow out of such an indelicate conversation and not seem like a total wet blanket? I have surgery scars and other battle scars from falling out of a tree when I was little but no purposely-placed curiosities. Not that I haven't entertained the idea from time to time, but I could never come up with a real reason to subject myself to pain on purpose. I still vividly recall that my grandfather had an old lady on his arm. She was a wrinkly old prune with a sourpuss face. As a young child I'm supposing my brain didn't know how to extrapolate that as you age the skin wrinkles and losses its collagen and elasticity and so goes anything you have placed on it. These ladies were going on and on and my instructor was taking for-ever when one of the ladies blurts out, "I want to get more tattoos because it's the one thing I can take with me to the grave". The other added in, "I got this one when I was only seventeen and it was thoughtfully planned out and I want to have it changed into something else soon". My head was in internal convo overdrive at that moment; "Um, having had two very recent 17 years olds, I can tell you for certain nothing they do is thoughtfully planned out", "Can't tell if those are words or oddly placed black smudges all over this lady and not quite sure if I want to put my reading glasses on to find out", "I'm sure this is some sort of weird human bonding ritual, but nevertheless I'm thinking of getting my cardio by running briskly out the door". That's when I decided it was my perfect opportunity to exit this conversation and get out while I could so I retorted, "Well technically you can take them to the grave, but in the end when your skin rots you'll have nothing". One should never say never though, who knows maybe one day I'll find myself drunkenly slumped in a tattooist chair telling them to tattoo "free all the cookies" on my but cheek one day, but for today I'm pretty sure I good. Combine all the ingredients in a small jar (a mason jar works great) and shake or stir until combined. Store leftover dressing in the fridge. 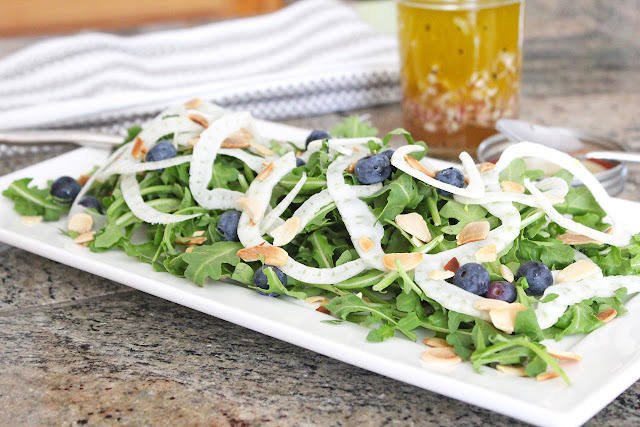 Place the arugula, almonds, blueberries, and fennel in a large salad bowl and toss with the dressing just prior to serving. I also know it's probably a good thing I don't tell people about my strange food hobby, I can only imagine what kind of internal head convos they'd be having. No wonder we get each other. Meantime, fennel. I love it, but didn't grow up with it, so have yet to use it at home. Now I have no excuse. Thanks, Gina! Keep up the good work. I'm saying this right out of my head: YOU CRACK ME UP! :) Brava! Thanks my lovely friend. Try the fennel, shaved it's much better in my opinion than roasted. That's a great looking salad...I had some arugula salad the other day too. One of my favourite greens.